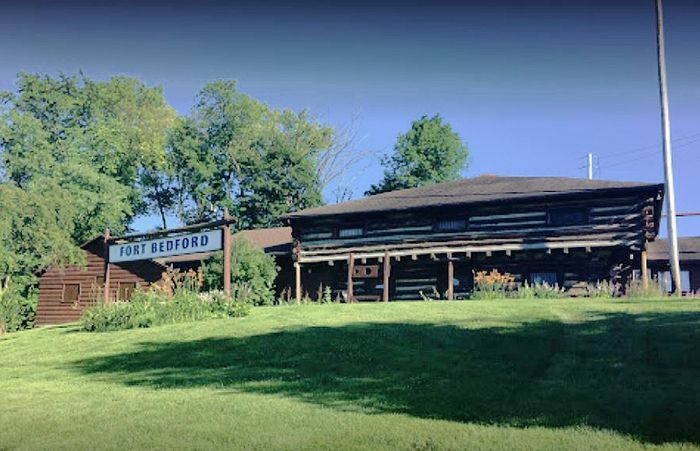 A French and Indian War-era British military fortification, Fort Bedford was located in what was then called Raystown, Pennsylvania which had been settled in 1751. Later, the town was renamed Bedford. After General Edward Braddock’s campaign to take the forks of the Ohio River ended in disaster, General John Forbes was placed in command of a new expedition to capture the strategic point guarded by Fort Duquesne. Forbes vowed not to make the same mistakes as his predecessor. Leading a small invasion force from western Maryland, his poorly defended lines of supply and communication were soon compromised. Forbes quickly changed tactics and wanting to launch a large invasion from eastern Pennsylvania, he ordered that a new pioneer wagon road blazed over the Allegheny Mountains. His plan also called for a string of forts and blockhouses to guard the supply road from hostile Indian bands, as well as the French. Called Forbes Road, the trail was blazed between June and November 1758. In the meantime, General Forbes ordered Colonel Henry Bouquet and his men to begin constructing forts and blockhouses along the road. After constructing Fort Juniata Crossing near present Breezewood, Pennsylvania, Colonel Bouquet led the efforts in building a supply post for the troops on Forbes Road. After searching the area for some time, looking for a site that was both defensible and had access to fresh water, he could find no spot with both these characteristics. He finally chose a site adjacent to the Juniata River west of a strategic gap in the mountains called “the narrows”. Keeping with the overall plan, the new site was about one day’s march from the Fort Juniata Crossing. The builders placed the fort on a high spot and devised an innovative fortified elevated gallery that provided access to water from the Juniata River. It is believed that Fort Bedford was the only fort ever constructed in America with this unique arrangement. 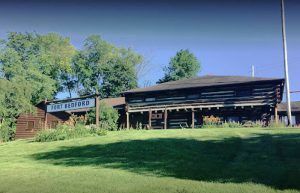 The star-shaped log fortress was first called the “Camp at Raystown,” but was soon renamed for the Duke of Bedford, a member of the Crown’s ministry during the French and Indian War. Completed in the summer of 1758, the fort featured five bastions with walls that enclosed an area of approximately 1.45 acres and was surrounded by the river and a dry moat that was nine foot deep, ten feet wide at the bottom and fifteen feet wide at the top. The main gate was located on the south side of the structure and was protected by an earthen rampart. The north side, which faced the river, featured the unique gallery to the riverbank. Described as the “Grand Central Station of the Forbes campaign”, the fort became an important communication and supply link for Forbes’s army as it moved deeper into the wilderness. Along with Fort Ligonier and Fort Pitt, it completed the east-to-west axis of the British army’s fortification of western Pennsylvania. Both General Forbes and Colonel Bouquet also used it as their headquarters for portions of the campaign. The British thought it was impregnable. After the bulk of the army moved westward, the fort was garrisoned by about 800 men, but, saw little action during the war. 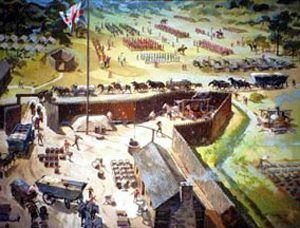 As the French and Indian War neared its end, the troops were moved to other forts. 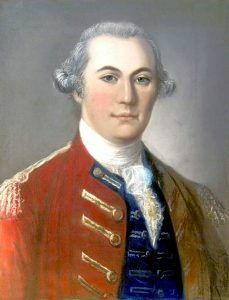 Captain Lewis Ourry, in command of the fort at the outbreak of Pontiac’s Rebellion, listed just 12 Royal Americans on his roster to guard the fort, with an area population of about 90 local families. 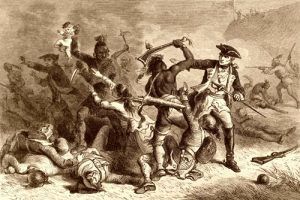 Despite the weakness of the garrison, the fort was never directly attacked by the Indians, who were, instead, raiding several local settlements and attacking supply trains bound for the fort. The arrival of reinforcements under Colonel Henry Bouquet in July 1763 ended most of the local raiding. After Pontiac’s Rebellion, the post fell into disuse; but, by that time, numerous businesses and settlers had created the town of Bedford. The fort was re-garrisoned by the Patriot-sympathizing Bedford County Militia during the American Revolution, guarding the area settlers against raids by British-allied native bands. It was said to have been the first British fort ever to be captured by American rebels, when, in 1769, 18 men led by James Smith (aka the “Black Boys”) captured it by obtaining admission through a ruse. They were protesting continued trade with the Indians. After the Revolutionary War had ended, several treaties in the 1780’s, including the Treaty of Fort Stanwix and the Treaty of Fort McIntosh, reduced the fear of Indian raids in the area and the fort was soon abandoned and later razed. George Washington stopped at the town of Bedford while leading troops into Western Pennsylvania to put down the Whiskey Rebellion in 1794 at which time the fort was gone.